These five Canon Tips for Bird Photographers will help you take better bird photos. 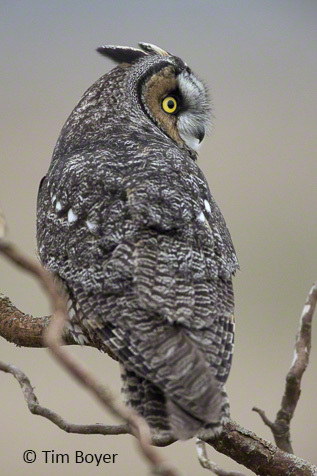 Wow what a winter, it's quieted down, but at one time there were half a dozen or more Short-eard Owls, two Long-eared Owls and a swarm of Northern Harriers just south of the Skagit. Then there was almost an irruption of Rough-legged Hawks this year. More then I've seen in a long time. I did the last of this season's Winter Birds of the Sakgit & Samish Bird Photogoraphy Workshops last Sunday. Here's a recap of the images from the winter months. A Long-eared Owl near Stanwood, WA. Both of these images were taken with the Canon 5D Mark III at high ISO. It was pretty dark. But, with the 600mm lens a 1.4 Extender, I did not have to get so close I was pressuring the birds. Someone said to stay 30 feet from the birds, but I had them land within 15 feet of me while I was walking back to the car. I think it's better to use a long telephone lens and just not pressure them, then let them decide how close they want to get. They're curious birds so often, given a chance, without pressure, they'll come to humans to see what we're doing. Short-eared Owl shaking it's feathers. For a few short weeks the Long-eared Owls were the main attraction, but there were also a bunch of Short-eared Owls working the same area. Then suddenly it all stopped. I think the owls must have exhausted the food supply and moved on. Rough-legged Hawk on a wire near the West 90 on the Samish Island Road. Mean while, up in the Samish there were a lot of Rough-legged Hawks this year, not as many as in the 1980's but enough that it reminded me of earlier years when there were more birds then people in the Skagit on the weekends. Snow Geese at sunset at Port Susan. For the first half of the winter I found more Snow Geese in the Stanwood area then on Fir Island. Later in the season (see the image below) I found them in fields near the tulips. This was the first year (the tulips are early) that I have had tulips and Snow Geese in the same image. It was a cloudy day, but by adding some contrast to the image in post processing I was able to get some definition between the sky and the Snow Geese. 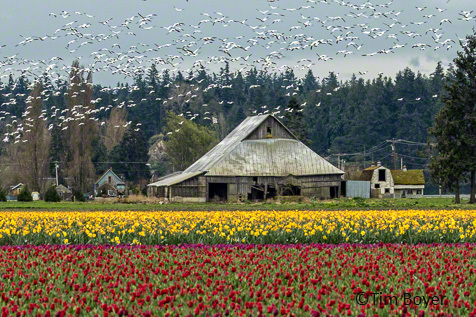 Snow Geese and tulips in the Skagit Valley.